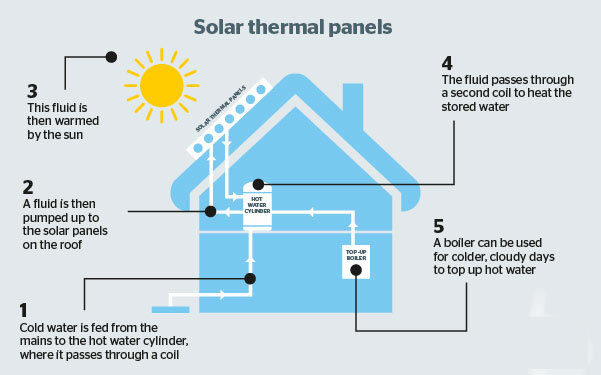 Solar panels produce hot water for the home using energy converted from the power in both direct and diffused sunlight. The panels are designed to work with existing heating systems that use a cylinder to store hot water and are the perfect partner to a new condensing boiler. A well sized solar panel system could provide up to 60% of your homes annual hot water requirements. Solar panels can also be used in non standard configurations to help with space heating as well as hot water. An example of this can be seen on our case study page. Have a look at the diagram on the left for a basic overview of how these systems work. By installing a solar panel you will be eligible for the Renewable Heat Incentive or RHI scheme. This is a government initiative to reduce carbon emissions and reward households who move away from fossil fuels to heat their homes. Working in a similar way to the Feed-in-Tariff for solar photovoltaic (solar PV) systems, owners of heat pumps will be paid according to the total heat load of the property in kilowatt hours, for seven years tax-free.